This year I discovered that fried food is tasty. Yes, apparently I hadn’t heard the news. I never really liked fried foods before and wasn’t much interested in them. 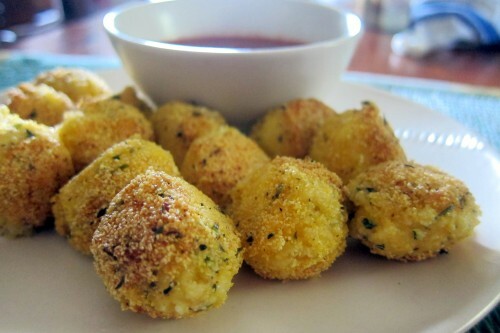 But then my husband had me taste fried mozzarella balls and I saw the light! We used to get them from the frozen food section of our local grocery store, but when I found out I was gluten intolerant I decided to make my own version of them. Not surprisingly, they were much better than the ready-made ones we had been buying. After I started making these, we….overindulged a bit. 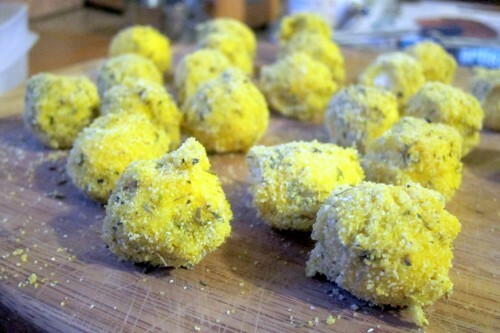 While Gianluca and I never reached a point where we got sick of these delicious fried cheese balls, we decided that they aren’t healthy enough to eat so often, so now we only make them on special occasions when we feel particularly gluttonous. A note on mozzarella cheese: As with just about every recipe I post, the ingredients I have access to in Italy are probably NOT the same as what Americans have access to. 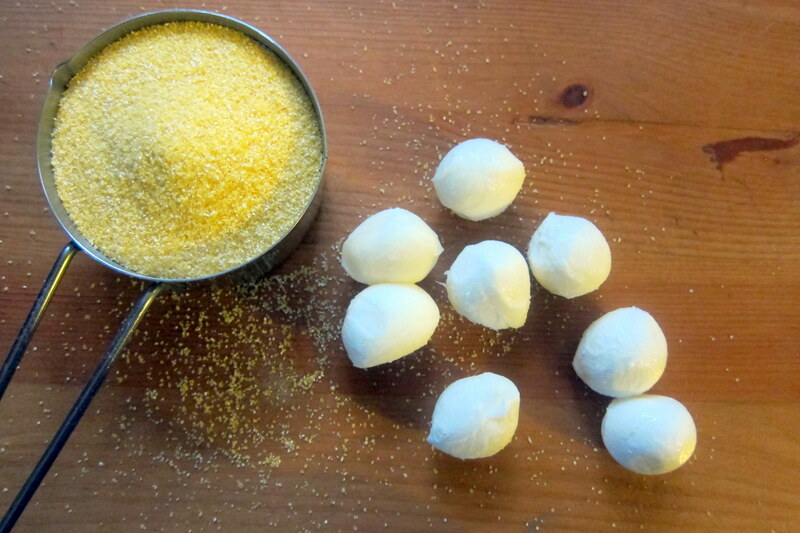 We buy little mozzerella balls that come floating in whey, but make do with what you have. 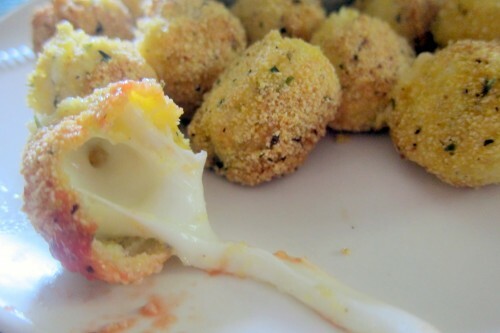 You can probably use string cheese cut into sections that approximate balls, or just make polenta crusted cheese sticks instead! I don’t usually measure when I make this; I mix together whatever herbs I happen to have on hand with my polenta and it always turns out fine. It is very important that your mozzarella balls are frozen. Drain and dry them and freeze until completely frozen. Otherwise this recipe won’t work. Mix together polenta, salt, pepper, garlic powder, oregano and thyme in a small/medium bowl. Put your egg whites in another bowl. Take your mozzarella balls out of the freezer, and dip in the egg whites, and then in the polenta mixture. Then dip in the egg whites and then the polenta mixture again. Doing this twice is important so that the coating is thick enough to hold the cheese in and make a nice crisp shell. I admit to being a bit conservative regarding frying oil. It scares me. If you have no fear of fat, feel free to deep fry these. 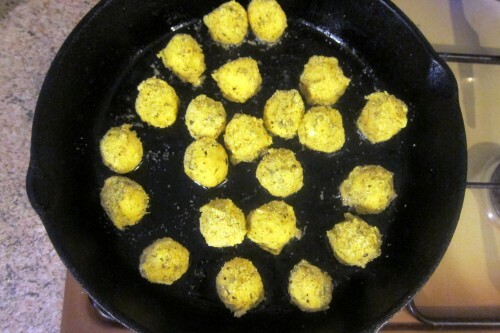 I put about 1 cm (1/2 inch) of oil in my pan, heat it and add my mozzarella balls. When they become golden on one side, I flip them, until they are golden all the way around. When they are golden, carefully remove from the pan and set on a paper towel covered plate. 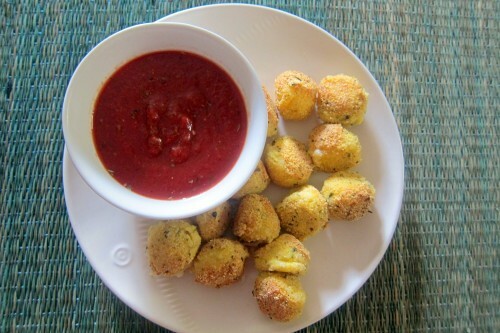 Eat with marinara sauce! I usually make a quick marinara sauce by heating tomato sauce I made from last year’s tomatoes mixed with the same spice mix that I put in the polenta. They should be crisp on the outside and ooey gooey in the inside! Oh dear, I think I need to make these again… be warned, they are dangerously tasty! ← Yes, your polenta should be be that thick!